Haben Sie das Produkt schon? Sehen Sie den QuickStart Guide an. Konect Pakbus Router ist ein Pakbus Routing Service zur Vereinfachung der Kommunikation über dynamische oder private IP-Adressen. Oft bieten die Netzwerkbetrieber keine öffentlichen festen (fixed) IP-Adressen an. Stattdessen erhält man eine dynamische IP oder eine fixed IP, die durch einen VPN-Tunnel angesprochen wird. Mit Konect Router können Sie einige PakBus Adressen durch diesen cloud-basierten Router ansprechen. Sie behandeln das wie eine feste IP-Adresse, deren URL und Port Sie von uns erhalten. 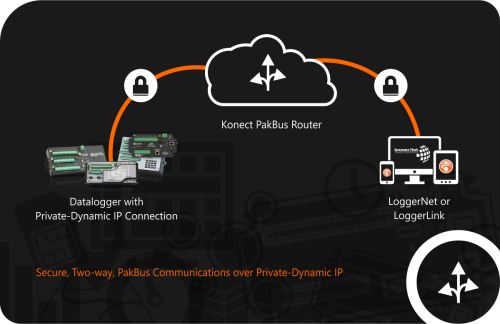 PakBus Routing — If dynamic IP is causing you a headache, let Konect smooth the way with a PakBus Router. Konect PakBus Router is a cloud-based service that supports all of Campbell Scientific's PakBus dataloggers*. The router acts as a bridge between a datalogger configured to connect to the router and our LoggerNet Datalogger Support Software. The datalogger connection to the router is most easily implemented by entering the router URL into the datalogger's PakBus/TCP Client Connections setting, or the connection can be initiated under datalogger program control using the CRBasic TCPOpen()/PPPOpen instruction. Konect PakBus Router is offered as a two-year subscription (two years of service, paid in advance). Subscription fees are based on a per-datalogger basis. You provide us with the unique PakBus address(es) of the datalogger(s) to which you want to connect, and we provide you with a URL/Port combination to use in the datalogger(s) and in the LoggerNet software. As your network of dataloggers grows, simply request that new PakBus addresses be added to your Konect PakBus Router service. *Some PakBus dataloggers do not have an internal IP stack and must rely on the capabilities of an IP modem to initiate the connection back to the Konect Router. This includes the CR200(X) and the CR10X, CR510, and CR23X dataloggers with a PakBus operating system. Note: Konect PakBus Router is also provided as a complimentary service with the purchase of any cellular-enabled device (stand-alone cellular modem or datalogger with embedded cellular modem).